Phagocytes are a type of white blood cell that use phagocytosis to engulf bacteria, foreign particles, and dying cells to protect the body. They bind to pathogens and internalise them in a phagosome, which acidifies and fuses with lysosomes in order to destroy the contents. They are a key component of the innate immune system. There are three main groups of phagocytes: monocytes and macrophages, granulocytes, and dendritic cells, all of which have a slightly different function in the body. This article shall consider the different phagocytic cells present within the body, their structure, where they are located and clinical conditions that may result from their deficiency. Monocytes are a type of phagocyte found in the bloodstream. They circulate around the body, and when a tissue is infected or inflamed they may leave the bloodstream and enter the tissue. In the tissue they differentiate into macrophages, which form the major resident population of phagocytes in normal tissues. Monocytes are phagocytic but since most infections occur in tissues, it is the ability of monocytes to differentiate that is particularly key. If a particular set of signals are present, it is also possible for monocytes to differentiate into dendritic cells in the tissues. Monocytes are the largest type of phagocyte, with a kidney bean shaped nucleus when seen under a microscope. Fig 1 – Electron micrograph showing a monocyte surrounded by red blood cells. Macrophages are derived from monocytes and are found in the tissues. They have a major role as a first defence mechanism in phagocytosis of cellular debris, microbes and any other foreign substances. They also help initiate the adaptive immune response by presenting antigens to T cells and secreting factors to induce inflammation and recruit other cells. 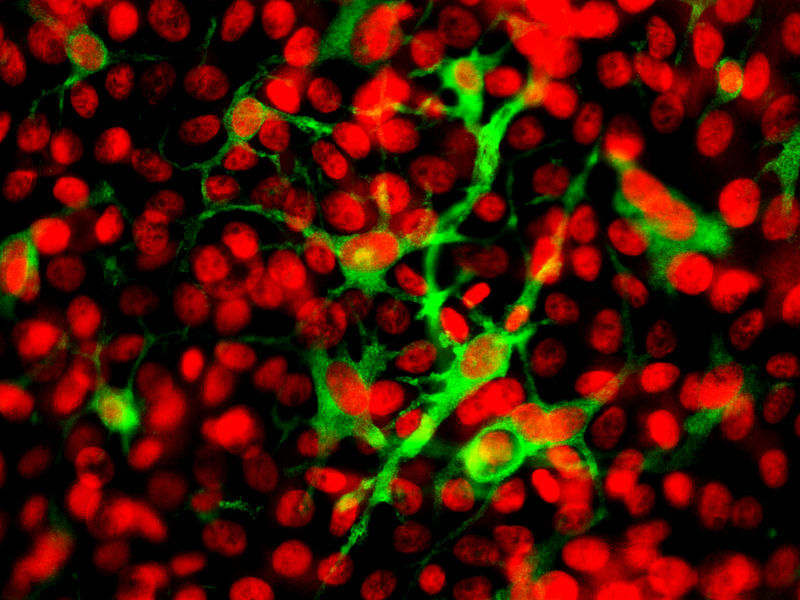 Macrophages may be termed differently depending on their location: microglia are present in the CNS and Kupffer cells are in the liver. Fig 2 – Diagram showing the location of Kupffer cells within the liver. The major function of dendritic cells is as a link between the innate and the adaptive immune systems. As immature dendritic cells they travel in the bloodstream and migrate through tissues and continually sample the pathogens they find via macropinocytosis. Following phagocytosis, the cell becomes mature and migrates to a peripheral lymphoid organ such as a lymph node, the spleen, or gut-associated lymphoid tissue to present the antigen to a T cell. This then activates the T cell to initiate an adaptive immune response. Dendritic cells can be recognised by the presence of multiple cytoplasmic projections from their surface, giving them a large surface area to volume ratio that aids close contact with multiple cells. These processes look similar to the dendrites of neurons, which gave dendritic cells their name. Fig 3 – Dendritic cells (stained green) located in the corneal epithelium. Granulocytes are a group of cells with dense granules in their cytoplasm, and include neutrophils, eosinophils, and basophils. 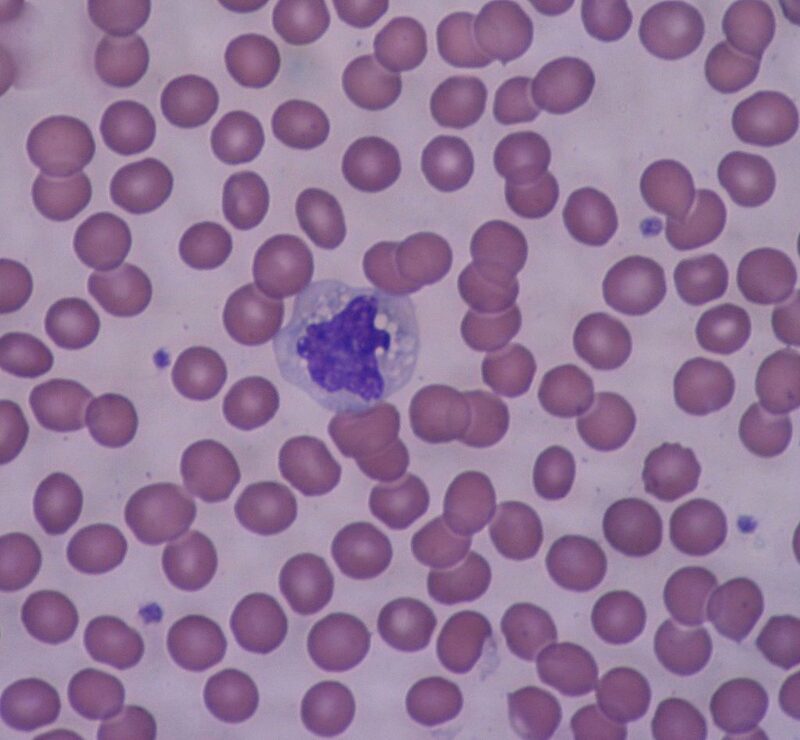 Neutrophils are the most phagocytic of these cells: they are the most abundant white blood cell, and can be identified by their granular cytoplasm and lobulated nuclei (usually 2-5 lobules). They are formed from myeloid stem cells found within bone marrow. They are normally found within the bloodstream, but during the acute phase of infection they are among the first inflammatory cells to reach the site of infection. They are particularly specialised at killing intracellular pathogens due to cytoplasmic granules with toxic substances such as antimicrobial peptides, enzymes, and reactive oxygen species. Neutrophils are short-lived cells and normally die following phagocytosis and use of their granules- dying or dead neutrophils are a major part of the pus seen with infection. Neutrophils are also important for inducing inflammation and recruiting inflammatory cells through release of cytokines and other inflammatory factors. 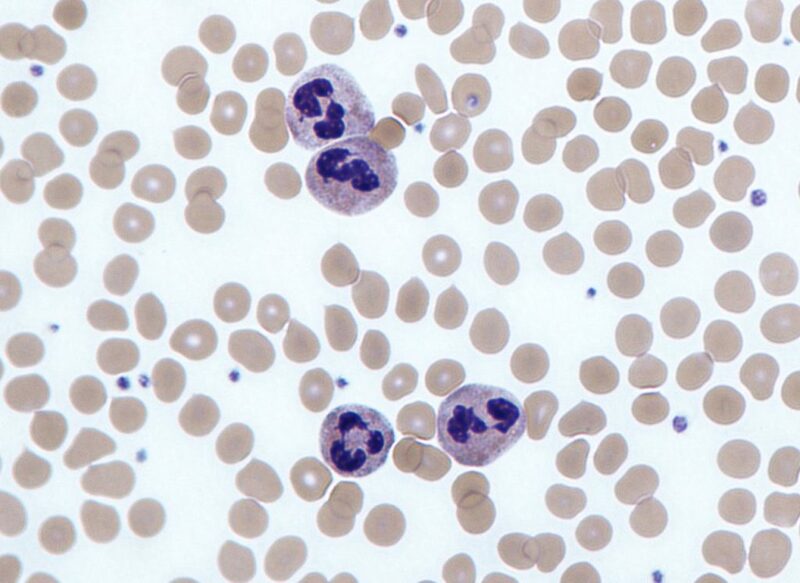 Fig 4 – Electron micrograph showing neutrophils on a blood smear. Neutropenia is a low neutrophil count, normally defined as less than 1.5 x 109/L. Neutropenia places patients at high risk of infections as they are a key component of innate immunity. If patients are neutropenic and unwell, they require urgent broad-spectrum antibiotics due to the risk of this progressing to septic shock. If patients are not unwell or febrile, consider ethnicity and review the drug history. Requesting a blood film may identify infection, autoimmune conditions, or lymphoproliferative disorders. Other investigations that may be helpful include viral serology and autoantibodies. If the only abnormality is isolated neutropenia, haematological malignancy is a relatively unusual explanation. Patients should be referred if there is suspicion of serious disease, progression, or development of other blood cell abnormalities. 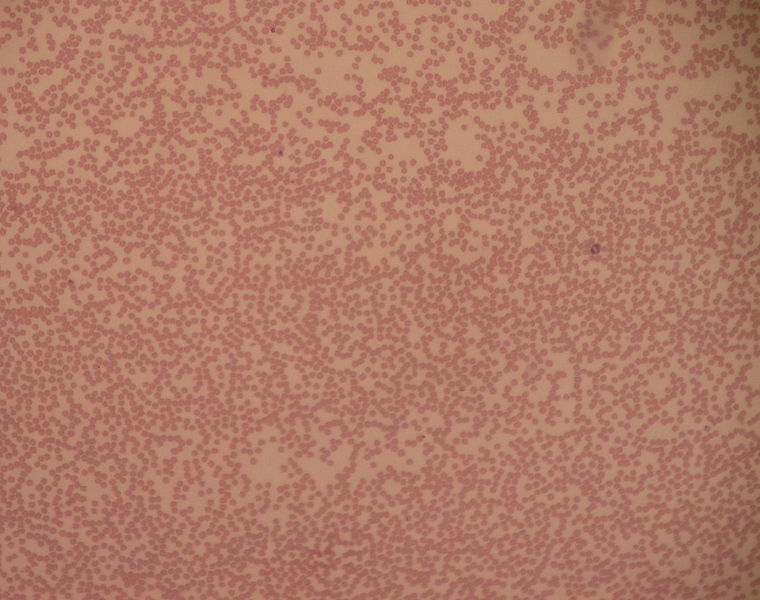 Fig 5 – Blood smear from a neutropenic patient showing only one neutrophil.